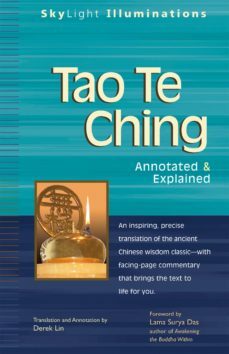 The enduring wisdom of the Tao Te Ching can become a companion for your own spiritual journey.Reportedly written by a sage named Lao Tzu over 2,500 years ago, the Tao Te Ching is one of the most succinct—and yet among the most profound—spiritual texts ever written. Short enough to read in an afternoon, subtle enough to study for a lifetime, the Tao Te Ching distills into razor-sharp poetry centuries of spiritual inquiry into the Tao—the "Way" of the natural world around us that reveals the ultimate organizing principle of the universe.Derek Lins insightful commentary, along with his new translation from the original Chinese—a translation that sets a whole new standard for accuracy—will inspire your spiritual journey and enrich your everyday life. It highlights the Tao Te Ching’s insights on simplicity, balance, and learning from the paradoxical truths you can see all around you: finding strength through flexibility (because bamboo bends, it is tough to break); achieving goals by transcending obstacles (water simply flows around rocks on its way to the sea); believing that small changes bring powerful results (a sapling, in time, grows into a towering tree).Now you can experience the wisdom and power of Lao Tzu’s words even if you have no previous knowledge of the Tao Te Ching. SkyLight Illuminations provides insightful yet unobtrusive commentary that describes helpful historical background, explains the Tao Te Ching’s poetic imagery, and elucidates the ancient Taoist wisdom that will speak to your life today and energize your spiritual quest.